which produces the following figure. 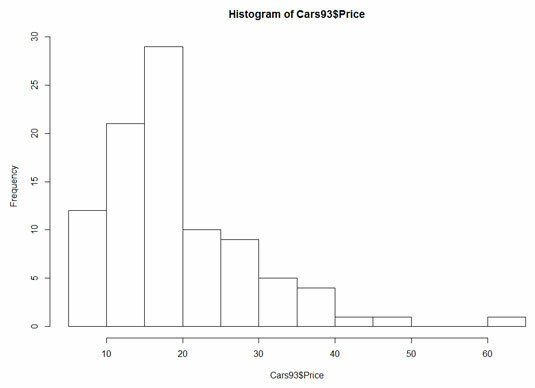 Initial histogram of the distribution of prices in Cars93. How do you spruce it up? By adding arguments. to the arguments. You can use ylab to change the y-axis label as well. 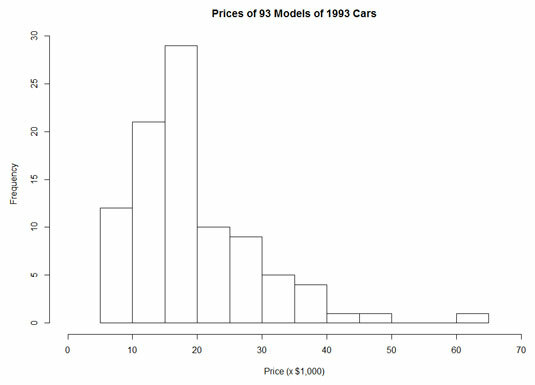 main = "Prices of 93 Models of 1993 Cars"
When creating a histogram, R figures out the best number of columns for a nice-looking appearance. Here, R decided that 12 is a pretty good number. You can vary the number of columns by adding an argument called breaks and setting its value. R doesn’t always give you the value you set. Instead, it provides something close to that value and tries to maintain a nice-looking appearance. Add this argument, set its value (breaks =4, for example).